Born in comparative obscurity, at an engine works in the USA, in 1872, a locomotive known as the Countess of Dufferin, CPR No. 1, still lives and ranks high in the historical lore of Manitoba and the West. A fast runner at the age of onethoroughly schooled in railroading at fourshe was raised to the rank of a Countess and became the first "Lady" of the locomotive world in Western Canada at five. An intrepid "mountain climber" at fourteen she had personal acquaintance with high Government officials, railway presidents, Indian Chiefs and many others and now has a place of honour, in retirement, in Winnipeg. The arrival of the Countess of Dufferin, Winnipeg, 9 October 1877. In 1877, a contractor named Joseph Whitehead purchased this engine and moved it on a Red River barge from Fisher's Landing, Minnesota to St. Boniface, for the construction of the future Canadian Pacific Railway. Two days after its arrival at St. Boniface, on 9 October 1877, the engine started to pull cars of rails and material for construction work on the Pembina branch. It was then used between Selkirk and Cross Lake by the Government, and later sold to the CPR in 1882, for the sum of $5800. Early in 1877, Whitehead had been given a Government contract and, having knowledge of the proposed visit of the Governor-General and Lady Dufferin, he extended an invitation to their Excellencies to take part in the ceremony of driving the first track spikes of the new branch at St. Boniface. He also invited the Countess to start the first engine but the locomotive did not reach Winnipeg from the USA until after the departure of the Vice-Regal couple on the steamer Minnesota on 29 September. By that time the engine had reached Fisher's Landing and was available there for inspection by the Marquis and Lady Dufferin when they arrived on the southbound steamer. In this connection the Countess made the following record in her published diary: "Tuesday Oct. 2nd.  We went ashore and saw the engine No. 2 of the Canadian Pacific Railway; it is going to Winnipeg with a train of railway-trucks, and it is to be called the 'Lady Dufferin'." While the number of the locomotive was recorded in the diary as No. 2, at Fisher's Landing, the number was changed to No. 1, enroute, probably by contractor Whitehead, as it arrived in St. Boniface bearing the number 1. 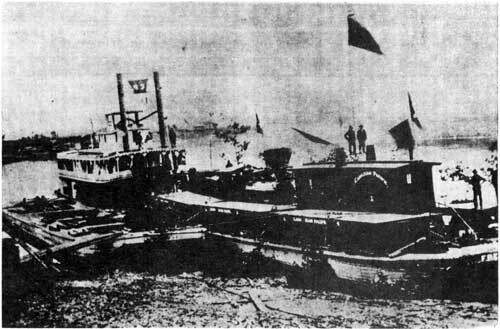 The famous little engine, loaded on a barge, was towed away from Fisher's Landing by steamer Selkirk, shortly after receiving the blessing of Lady Dufferin. They expected to reach Winnipeg on 8 October but a delay occurred at Crooked Rapids, and it took from daylight until 3:00 p.m. to pass them. A stop was also made five miles south of Winnipeg so as to reach Winnipeg in daylight. The following morning, 9 October, the steamer continued the historic journey towards Winnipeg. It was a gala affair, with hundreds of settlers lining the river banks. "At an early hour this morning, wild, unearthly shrieks, from up the river, announced the coming of the steamer Selkirk, with the first locomotive ever brought into Manitoba. 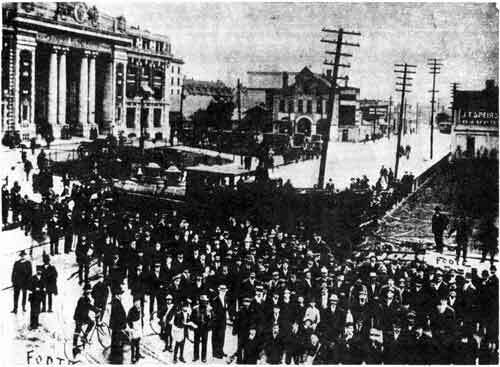 A large crowd of people had assembled on the river banks, and as the Selkirk steamed down into the city the mill whistles blew furiously, and bells rang out to welcome the arrival of the "Iron Horse." The Selkirk was handsomely decorated for the occasion with Union Jacks, Stars and Stripes, banners with the familiar 'C.P.R.' and her own bunting; with the barge conveying the locomotive and cars ahead of her, also daily decorated with flags and evergreens, and with a barge laden with railway ties on each side presented a novel spectacle, The continuous noise and din proclaimed loudly that the iron horse had arrived at last." The locomotive was unloaded from the barge at St. Boniface on 10 October and was put to work the following day. The Countess of Dufferin being moved to a site in Sir William Whyte Park, 1910. It was this engine that pulled the first excursion train operated in the West, which ran from Winnipeg to East Selkirk on 19 December 1877. It was also the "Iron Countess" that handled the train that brought William C. Van Horne from Emerson to St. Boniface on 31 December 1881. Van Horne, who had been engaged as general manager by the Canadian Pacific Railway, commenced duties immediately after reaching Winnipeg, and rented an office over the Bank of Montreal on Main Street. However, a fire caused him to move from that location and he engaged space in the Old Grace Church, also on Main Street, and carried on the business of the CPR from there for a time. For the next few years the "Iron Countess" was used on various local and main line runs, including mountain service, west of Calgary. By 1897, the traffic called for heavier locomotives burning coal, and the Countess, which was a wood-burner, was sold to the Columbia River Lumber Company at Golden, BC, for the sum of $1,000, to be used by them in switching service. But in the year 1910, Controller R. D. Waugh, of Winnipeg, learned that this historic little engine had been relegated to storage tracks; was idle and without steam. He persuaded the lumber company to donate the engine to the City of Winnipeg, and Mr. Waugh then arranged with the CPR for free movement to that city. Immediately after its arrival the railway gave the locomotive a thorough overhauling and also built a special track on which to move her from the main line, over Higgins Avenue to her first location, which was in Sir William Whyte Park, opposite the railway station. Thirty-two years later, on 9 September 1942, nearly sixty-five years after her arrival in Manitoba, the 25-ton engine was moved across Higgins Avenue close to the station. There she now stands for all to seea picturesque reminder of those epic days, when Canadians thrust a railway across the West to bind the nation together.